Jambukeswarar Temple,Thiruvanaikaval is a sacred saivite shrine of Shiva located in Thiruvanaikaval also known as Thiruvanaikal,Tamil Nadu, a suburb of Trichy,on the northern banks of the Cauvery river adjacent to Srirangam. It is one of the 275 Paadal Petra Sthalams ( Shiva Sthalams glorified in the early medieval Tevaram poems by Tamil Saivite Nayanar saints Tirunavukkarasar, Thirugnana Sambandar and Sundarar). The name of the Lord here is Jambukeswarara and the name of the Goddess is Akilandewari Amman. Thiruvanaikaval is one of the Pancha Bootha Sthalams (five holiest Shiva temples), each representing one of the five natural elements. Thiruvanaikaval represents water (appu) hence this is called as Appusthalam. The other four temples are Nataraja temple,Chidambaram representing akasha (upper sky), Ekambareswara (earth) at Kanchipuram, Arunachaleswara or Annamalai (fire)at Thiruvannamalai and Kalahasti Nathar (wind) at Kalahasti. There is a freshwater spring underneath the main deity of Shiva Lingam ,which has a perennial flow. As per one legend,Paravathi was asked to go to earth to do a penance by Shiva. Parvathi in the form of Akilandeswari came to the Jambu forest, now known as Thiruvanaikal,made shiva Linga out of water from river Cauvery under a Naaval tree (Jambu tree).Pleased with her penance,Shiva appeared and gave darshan to Akilandeswari. As per another legend, two Siva Ganas 'Malyavan' and 'Pushpadanta', who were always quarelling and fighting each other. One day Ganam Malyavan cursed Ganam Pushpadanta to become an elephant on earth.Pushpadanta in turn cursed Malyavan to become a spider on earth. Both came to Jambukeswaram and continued their Shiva worship. The elephant collected water from river Cauvery and bathed the Lingam under the Jambu tree daily.Ganam Malyavan as spider, constructed a web over the lingam to prevent dry leaves from the jambu tree dropping on the Lingam. When the Ganam Pushpadanta in elephant form saw the web ,removed the cobwebs and cleaned the Lingam by pouring water and the practice continued daily. Ganam Malyavan spider became angry and bit the elephant to death, and the spider also was killed. Shiva moved by the devotion of the two Ganas, relieved them from the curse. As an elephant worshipped Shiva here, this place came to be known as Thiru Aanai Kaa (forest of holy elephant). Later the name 'Thiruaanaikaa' became 'Thiruvanaikaval' and 'Thiruvanaikoil'. In the next birth, the spider was born as the King Kochengot Chola and built 70 temples and this temple is the one among them. Remembering his previous birth enmity with the elephant, he built the Shiva Sannidhi below ground level with a very small entrance so no elephants can enter. You can observe that the entrance of Jambukeswara sannidhi is only 4 foot high and 2.5 foot wide. The temple at Tiruvanaikaval is a big one covering an area of about 18 acres with high walls and gopurams on all the 4 sides.There are five praharams (corridors). The outer wall of the fifth praharam is massive, stretches over a mile and is two feet wide and over 25 feet in height. Legend says that the wall was built by Shiva himself working alongside the laborers. 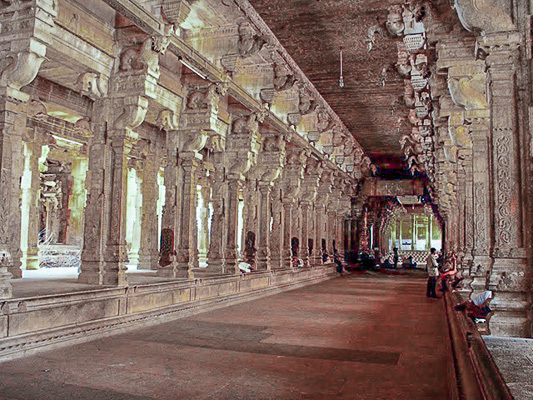 The fourth praharam has a huge mandapam with 796 pillars. It has a pushkarani (temple tank) fed by perpetual springs. The inner most praharam has the sanctum.The shrine for mother Akilandeswari is situated in the fourth praharam. The main sannidhi is situated below ground level and you have to descend three steps from the sannidi entrance. The moolavar deity can viewed through a stone window that has nine openings. Entrance into the sannidhi is through a small door about 4 feet in height. Devotees are admitted in groups of five to six into the sannidhi or on payment of a small fee, if it is crowded. The lingam of Jambukeswarar is said to be swayambu (self manifested). The height of the lingam is about 3 feet from the floor of the sanctum. A water spring is said to emerge from the lingam, which we can see by the wetness of the vastrams adorning the Shiva Lingam. The water flow increases significantly during the rainy season. The only source of illumination within the sannidhi are the ghee lamps,which gives the devotees a divine glow of the moolavar. The deities of Jambukeswarar and Akilandeswari are installed opposite to each other. The sannadhi of the Akilandeshwari and the sannadhi of Prasanna Vinayaka are in the shape of the pranava manthra symbol "Om". 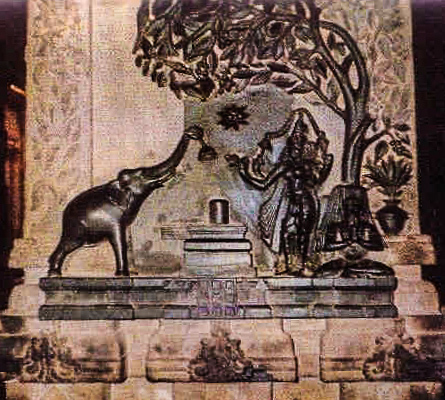 It is believed during one of Adi Sankara's visit he installed the Prasanna Ganapathy idol right opposite to her sannidhi and installed a pair of Sri Chakra thadangas (ear rings) to pacify an angry Goddess Akilandeswari and to ensure that she remains in a Sowmya and Shantha Roopam. Rituals: As Akilandeswari worshipped Lord Shiva in this temple, even today at noon the Archakar (temple priest) dresses in a female attire and does Pooja to Jambukeswarar and a Gho pooja to black colored cow,called Karam Pasu. This uchi kaala pooja is very famous and a lot of people every day. Annabhishekam to lingam (covering the lingam with cooked rice) is a daily ritual performed in the temple. Important Festivals: Five poojas are performed in a day at the sanctum sanctorum. 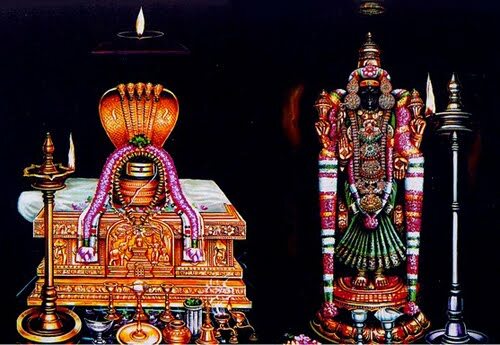 Vaikasi - Vasantha Urchavam (10 days) during the month of Vaikasi (Apr-May), Aadipuram festival (10 days),Aadi Friday is celebrated during the month of Aadi (mid-July to mid-August),Navarathiri festival (10 days) during Puratassi (September–October),Thai Poosam, Thai theppam (Float) festival during January-February.Brahmotchavam (40 days) during Panguni (February - April ) are some of the important festivals. Car festival and Panchaprakara festival are other important festivals. Temple location The temple is in Thiruvanaikaval or Thirvanaikoil, 7 kms from Trichy Central. Other notable temples nearby Nachiar Koil Azhagiya Manavala Perumal Temple is one of the 108 vaishnavite divya desams,an ancient Shiva temple Panchavarnaswamy temple,SriRangam Ranganathan Temple Thirukkarambanoor in UthamarKoil ,another one of the 108 divya desams are in the near vicinity of within 10 kms.